ROYAL Caribbean International unveiled its next generation of cruise ships when the first piece of steel was recently cut for the first of two Project Sunshine ships. The steel cutting took place at the Meyer Werft shipyard in Papenburg, Germany, where the two ships will be built. The two new ships named Quantum of the Seas, set to debut in fall 2014, and Anthem of the Seas, which will follow in spring 2015, will be part of the Quantum class of ships and will build upon Royal Caribbean’s legacy of revolutionary ship design and bold innovation. Royal Caribbean International’s legacy is built on introducing ‘at sea firsts’ such as rock-climbing walls, ice-skating rinks, surf simulators, zip lines and even a tropical park with over 12,000 live plants. The Quantum class of ships will continue to build on this legacy with unprecedented experiences and amenities. They will once again deliver on Royal Caribbean’s tradition of designing for ‘WOW’. Closer in the Middle East region, RCI welcomed its newly revitalised Serenade of the Seas in Dubai its new home until mid-April, giving cruise enthusiasts the opportunity to explore the region on seven-night round-trip sailings stopping in Fujairah, Muscat and Abu Dhabi. 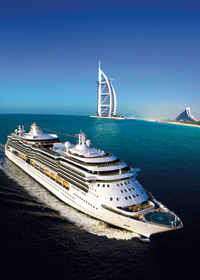 Her visit follows three successful Middle East seasons by sister ship Brilliance of the Seas. 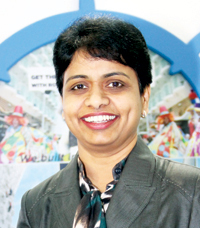 Lakshmi Durai, executive director Middle East, said after another successful year of operations in the region, RCI continues to offer the best in cruising experience on board the newly revitalised ship. “Today’s cruise ships are like floating resorts with all of the choices you would expect of a fine resort, but better because they take you to new destinations as well. “Over seven days and nights, guests will marvel at the spectacular scenery on show in this part of the world and while the ship is in port, they can explore the charismatic towns and cities and learn more about the fascinating culture of the UAE and Oman,” she added. While the 2014 deployment will not feature any Gulf itineraries, Durai is confident of strong demand for the traditionally popular European and Caribbean itineraries. The Radiance-class ship had recently undergone a $29 million revitalisation at the Navantia Ship Yard in Cadiz, Spain, and now offers a host of new dining concepts, entertaining options and technological advancements. The company is currently undergoing a $300 million revitalisation programme that will upgrade all tis ships. Each revitalisation takes around one month and includes adding new dining venues, more balcony staterooms, entertainment options such as an outdoor movie screen, technology enhancements and more. After her revitalisation, Serenade of the Seas now has almost double the dining options, including five of Royal Caribbean’s most acclaimed signature dining concepts. The ship also offers a multitude of entertainment experiences, particularly for those seeking an adrenaline rush. The five-storey Centrum offers as daytime activities, dazzling nighttime entertainment and a new high-flying show in which aerialists glide through the atrium. From Dubai, the Serenade of the Seas will return to Barcelona for 12-night sailings visiting Venice and Greece. In November 2013, she will return to North America and sail seasonally from New Orleans offering seven- and nine-night Caribbean and Bahamas itineraries.